Two Boston bus carriers shut down by federal authorities earlier this year are now trying to get back up and running. The bus carriers, Lucky Star and Fung Wah, ran regular bus trips between South Station and New York’s Chinatown. Our Boston bus accident attorneys know that the Federal Motor Carrier Safety Administration data shows 283 people were killed in bus crashes in 2011 alone. Since bus crashes can be serious and even fatal for passengers, motorists should be cautious about riding on bus carriers with a history of federal violations. The Federal Motor Carrier Safety Administration oversees both commercial trucks and commercial buses, and can revoke the operating authority of bus companies that fail to live up to their safety obligations. The FMCSA exercised this authority to shut down Fung Wah and Lucky Star as a result of serious deficiencies. Fung Wah’s operating authority was revoked because the FMCSA identified cracks in many of the bus frames and because the company failed to turn over safety records for inspection. Other violations uncovered by FMCSA officials included falsified maintenance records and operation of buses after they had been ordered out-of-service for safety violations. Lucky Star also had maintenance problems with their buses leading to the shut down. In the last year that the company was operating, its buses broke down more than 80 times. 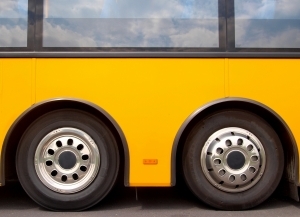 The FMCSA found rotted floors on its buses and bad brakes. The company was even failing to monitor the number of hours its drivers worked and was not even conducting drug or alcohol tests on drivers. These serious violations are enough to frighten any customer and are an important reminder that bus companies aren’t always as safe as they should be, even when federal regulations impose minimum baseline requirements that must be met. The Boston Globe has reported that both companies are committed to doing better in the future, with Lucky Star saying it has spent almost a million dollars to lease five new buses and upgrade its operations. The company also fired four drivers who were not able to pass an English language test. Fung Wah has put its drivers through a new training program, and has adopted a new maintenance plan. If the changes made are enough to convince the FMCSA that the companies now take safety seriously, the bus companies may be allowed to resume operations. Both will be required to submit quarterly reports to the FMCSA for four years following reinstatement, detailing the status of the company’s fleets and providing information on drivers including drug tests and speeding violations. Hopefully, these requirements will be enough to ensure that the bus companies operate in a safe way going forward. Passengers should be cautious about riding on these or other buses operated by companies with a record of safety violations, and before deciding to ride on any motor carrier, passengers should visit the FMCSA’s website to find out if the bus company has a good safety record. If you or someone you love has been injured in a traffic accident in the Boston area, contact Jeffrey S. Glassman for a free and confidential appointment to discuss your rights. Call 1-877-617-5333.